Looking for some fun outdoor adventures for your kids? Watersports Guru has you covered, whether it be for weekend fun or birthday parties. Click on the below options for further information. You can book online by simply clicking the BOOK NOW button on the right. Click here for pricing and bookings. Swap screen time for green time by signing the kids up for our Junior Adventure Guru program, available every Sunday from 9am to midday and mid-week during school holidays. This three-hour Nature Play program is all about fun and adventure, with loads of different activities based on the natural environment of our waterways. 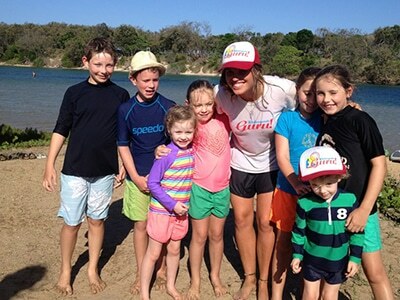 We keep the kids active and engaged by switching it up between stand-up paddleboarding, kayaking, snorkelling, fishing, creek explorations, outdoor education and fun team challenges. At the same time, they’re also learning important life skills and lessons – about water safety and how we need to care for the environment, as well as engaging their sense of curiosity. 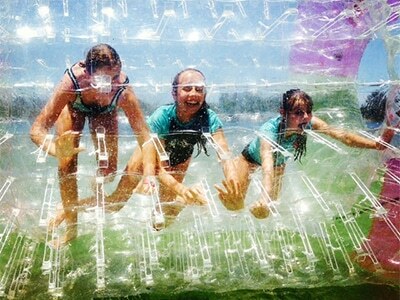 Our Watersports Gurus are really just big kids themselves. They make sure everyone gets involved and has a good time, but they’re also fully qualified in activities, safety and first aid procedures. Meet at the Watersports Guru’s Red Tent HQ at Kingscliff Bridge for introductions and safety briefing. Parents to sign in participants and then free to go and enjoy the sunshine, a cup of tea and some R&R. Kids will have an opportunity to meet the other JAGS and share their experiences of memorable holiday moments. All kids will be kitted up with lifejackets, lathered in sunscreen and given big smiles and high fives before beginning activities. Our guide/s are trained to ensure JAGs are all comfortable with the chosen activities, guiding each participant through simple steps, safety considerations and how to get the best out of their experience. Activity program may include a mix of stand-up paddle boarding, kayaking, snorkelling, fishing, creek explorations, outdoor education and team challenges. Please note that not all activities listed will be offered in every session. Swap ‘Screen time for Green time’ by giving your kid the ultimate birthday party! It’s 90 minutes of fun, adventure and loads of different activities based on the natural environment of our waterways. 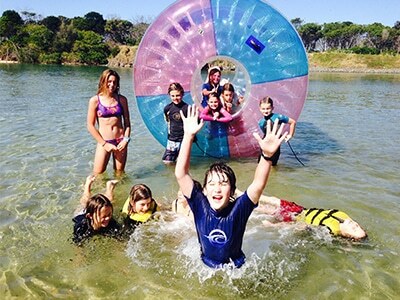 We keep the kids active and engaged by switching it up between stand-up paddleboarding, kayaking, snorkelling, fishing, creek explorations and fun team challenges. Meet at the Watersports Guru’s Red Tent HQ at Kingscliff Bridge for introductions and safety briefing. Parents to sign in participants and then free to go and enjoy the sunshine, a cup of tea and some R&R. Our guide/s are trained to ensure kids are all comfortable with the chosen activities, guiding each participant through simple steps, safety considerations and how to get the best out of their experience. SUITABLE FOR: Children aged 7 to 17 years and of course big kids too!